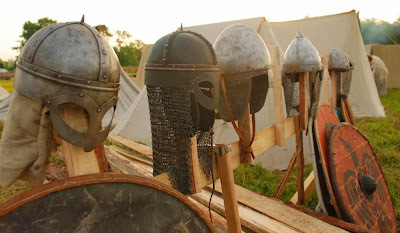 The last of Hastein`s viking army dispersed into East Anglia, Northumbria and the Seine area. Vikings have been wintering at Quatford , but in the spring they attacked the Southern Wales kingdoms of Brycheiniog, Gwent, and the Gwynllg region of Glywyssing. Asser recorded that Elisedd of Brycheiniog requested help from Alfred the great, but another reason for this may also be due to pressure from Anarawd ap Rhodri, the powerful king of Gwynedd and Deheubarth who is keen on expanding his areas of control. Dyfed's Hyfaidd ap Bledrig may be another southern Welsh king who, during his lifetime, similarly appeals to Alfred for aid and support to ward off Anarawd. Odo of Paris and Charles the simple did not have the strength for a serious defense and the Franks suffered again from viking raids.